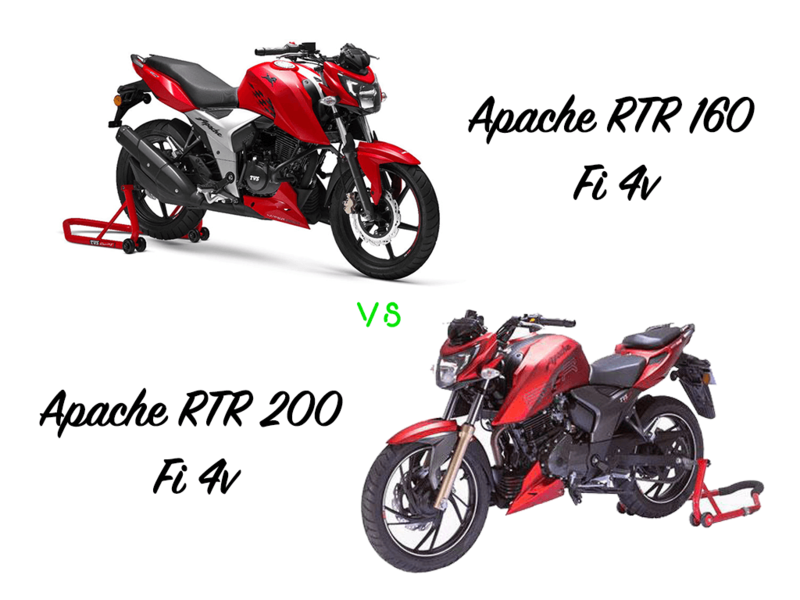 This is a comparison between the 2018 TVS Apache RTR 160 vs RTR 200, we have taken the Fuel Injected, 4 valve variants of both. Without further ado, let’s check out the new features in the RTR 160 4V, shall we? Looks wise there are not a lot of changes you will witness in the RTR 160 4V. The whole body structure, LED tail light, digital instrument cluster, and the exhaust are all inspired from the RTR 200 4V. The only differences you will notice is the LED headlight with AHO feature, center body panel, single-piece seat and the handlebars on the 160. Both have a single cylinder 4 stroke engine. Apart from the obvious engine displacement (cc) between the two, the only difference you will notice is, of course, the power and torque. The 160 delivers a power of 16.8 PS at 8000 rpm and a torque of 14.8 Nm at 6500 rpm. Coming to the 200, it yields a power of 21 PS at 8500 rpm and 18.1 Nm at 7000 rpm. RTR 160 clocks at 114 kmph and 0-60 in 4.8s, whereas the RTR 200 clocks at 120 kmph and 0-60 in 4.67s. Apart from the new body graphics on the RTR 160, there are no other new features. Both the RTR’s come with disc brakes, tubeless tires, and alloy wheels. Undoubtedly self-start is there on both the bikes but kickstart is missing in the RTR 200. Also, there is a lack of slipper clutch on the RTR 160, not a huge disappointment as it doesn’t contribute to engine performance but it would have been a nice feature if it were there. RTR 160 is available in 3 colors i.e. Racing Red, Metallic Blue and Knight Black, whereas the RTR 200 is available in 8 different colors Matte Red, Matte Yellow, White, Matte White, Matte Grey, Matte Black, Black, Black and Red. The pricing of RTR 160 Fi 4V starts from Rs. 89, 990 and RTR 200 Fi 4V starts at 1.08 lakh. All prices ex-showroom Delhi. I think its more than clear that RTR 160 seems to be the winner here, a price difference of 18,000 is more than nominal. The only strong rival to RTR 160 in this segment is the Honda XBlade. In my opinion, it is a poor man’s machine in this segment, since there is no fuel injected version we cannot even contrast the two. If you are looking for a best in class performer, and you have got what it takes to wield the mighty RTR then the 160 might just be the one made for you.